Only speculations exist about the origin of the word “Lohmann“. It is known that in the Low-German language “loh” had something to do with grove, bushes and woods. So even wood has been created for the extraction of tanbark. By composition with “mann” (eng. : man) as a human being who worked there the word “Lohmann” might have been developed. The “Püntker” Bernard Lohmann (*1795), called “Deeters Bernd”, is seen as the progenitor of the Lohmann family. As early as 1817 he became a boatman servant and a mariner in Haren. His wife’s name was Helena Schmitz (*1790), called “Gosevort”. The grand-progenitor was Joan Bernd Lohmann who married Martha Deeters on November 16th ,1790. 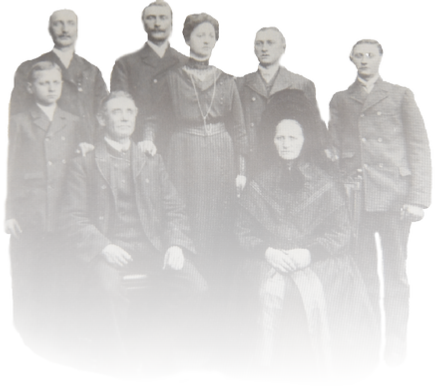 The day labourer and mariner Johannes Wilhelmus Lohmann (*1826) formed the next generation of the Lohmann family with his six siblings. First he was married to the sewer Christine Nordenbrok (*1825) who died early after giving birth to three children. In 1857 the servant maid Maria Adelheid Lübbers (*1827) became his wife; five children were born. But only Bernhard Heinrich Lohmann (*1854) ensured the continuation of the family name – he was a son of his father’s first marriage. First he was a day labourer later a self-employed “Püntker". He had six children (five boys, one girl) with his wife Maria Thekla Lammers (*1856). All of his children have been made familiar with the “Pünten”-Shipping. It therefore came as no surprise that all of his sons addressed themselves to the shipping business. As the changeover from wood to iron took place in the shipping business the sons and grandsons provided themselves with appropriate vehicles. Inland-Shipping and Sea-Shipping got practiced. This has changed radically nowadays even though the profession in this family did not extinct. Captain Hermann Lohmann (*1961), son of Captain Engelbert Lohmann (*1930), is still the owner of seaships which nowadays do global shipping.